This plaque is on the wall of University College. 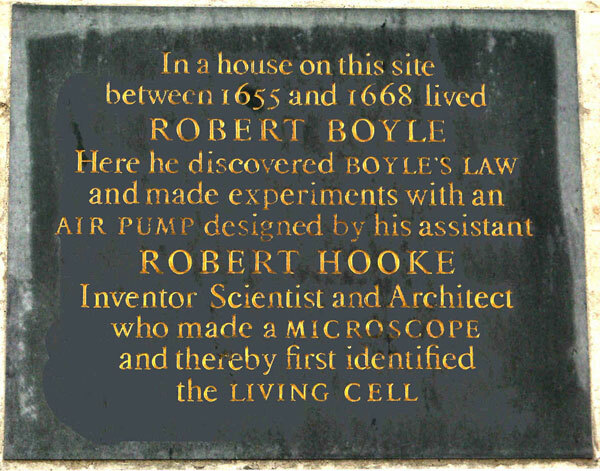 The apothecary Robert Boyle (1627–1691) lived on this site in a house with its own physic garden, known as Deep Hall, from 1665 to 1688. A famous painting of the High, painted by J. M. W. Turner in 1809/10, shows his house being demolished. A second seventeenth-century apothecary’s house with a physic garden stood nearby, and both were used for meetings of the Oxford Scientific Society. The part of University College on the site of the two apothecaries’ houses now contains the Shelley Memorial.